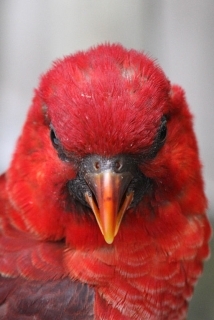 The Cardinal Lory makes forays between the many islands it inhabits. It has recently been reported from Ontong Java atoll (string of small coral islands) where it was not seen previously. Both adults in general red; dull buff/yellow margins on feathers of underparts; brown/red tail. Bill red with black at base; Eye ring bare and black. Skin at base of bill black with yellow blotches. Eye orange/red. As in adults but paler red on back and wings. Bill dull orange marked with black. Eye ring grey/white. Eye dull yellow. Calls are described as distinctive; coarse, shrieking, trilling or rasping. Aviary with well drained tiled or concrete sloping floor or suspended enclosure over same. Nectar - a commercial type or one homemade from: lactose-free baby cereal, honey, and malt extract or molasses, mixed with filtered water, with the addition of wheatgerm if desired, made fresh once or twice daily; fruit once or twice daily: apple, pear, orange, cactus fruits, papaya, mango, kiwi and bananas; one or more of: carrots, fresh corn on the cob or unsalted tinned sweet corn; green leaves such as: Swiss chard, lettuce, kale, dandelion, sowthistle or chickweed; rearing food made from hard boiled egg, wholegrain bread and carrot, all ground to crumbly consistency. Enjoys bathing so provide overhead misters or shallow water bowls. Provide unsprayed, flowering branches and other browse for foraging. Unknown but assume 11 weeks. New Hanover and islands to Buka and Bougainville, E Papua New Guinea, and Solomon Islands. Found up to 1200m (3936 ft) in mangrove, woodland, coastal coconut palm plantations and humid primary and secondary forest. Feeds on pollen, nectar, small berries and fruit. Noisy and conspicuous; are usually seen flying swiftly overhead in small groups which occasionally move between islands. Feeds in the canopy of flowering trees and coconut palms. Keeps company with the Rainbow Lorikeet (Trichoglossus haematodus).